Mix the salt in water and add this water little by little to the puttupodi till it becomes wet/ moist and mix thoroughly without any lumps. Keep it aside. Cook chicken with pepper powder and salt adding little water. Shred it and keep it aside. Heat 1 tbsp oil in a pan and saute ginger paste, garlic paste and chopped onions till transparent. Add curry leaves and chopped tomato and saute well. Add chilli powder, turmeric powder and garam masala and mix well. Add shredded chicken and mix well. Then add 1 tbsp grated coconut (optional) and stir well. Remove from flame. 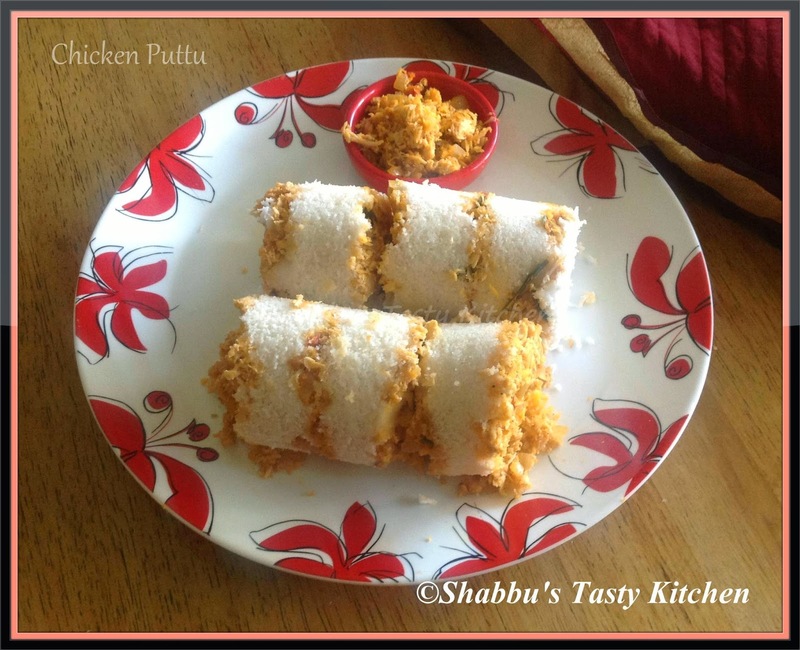 To prepare puttu, take a puttu maker and layer it with 1 tbsp grated coconut first, then the puttupodi and then the chicken masala as the third layer. Repeat the process, till the puttu maker is filled and the last layer with grated coconut. Never heard of chicken puttu! Good one!